It’s important to understand that postoperative discomfort from dental work is very common and often the least reviewed with a patient. My goal is to give you a better understanding of what to expect after dental treatment and how to best manage your particular situation. Like any other area of medicine that requires the body to heal after surgery, dentistry is no exception. Why does dental pain occur after treatment? Pain associated with dental treatment can be for very obvious reasons to very obscure. For example, an individual would anticipate pain after having a tooth removed, but would be mystified if discomfort were present after a routine filling. Pain associated with dentistry is strictly related to the trauma inflicted to the nerve in side the tooth and the surrounding structures such as the gums, bone, and periodontal ligament. Let’s begin with the less obvious reasons for pain. Accept the premise that whenever an instrument such as a drill is used on a tooth regardless of the simplest procedure the nerve will respond adversely. In other words, in order to accomplish the removal of a cavity, change a filling, or place a crown the nerve will be traumatized. When a nerve is traumatized several things can happen. The nerve will respond by being sensitive to hot and cold, possibly ache for a day or so, or become sensitive to chewing. This response can last for several hours to many months.The trauma may eventually lead to the symptoms not resolving or the nerve dying, which in both situations would require root canal therapy. As a patient, it’s important to understand your dentist cannot predict how your particular tooth will behave until the procedure is completed. The dentist’s role should be to perform his job within the clinical standards set forth by the profession and educate his clients as to what they may expect after treatment and to properly manage any complications that may occur. It is unfair for any patient to hold their dentist accountable for the potential discomfort associated with their treatment. It’s absolutely impossible to predict how your particular tooth will behave. What can you do, as a patient, and what should you expect after having one of the following procedures performed? Whenever a dentist removes a cavity or replaces an existing filling there is always the potential for postoperative pain such as hot and cold, achy ness, or chewing sensitivity. There is also a remote possibility the root canal therapy may be needed if symptoms become worse or the nerve dyes. Common reasons for postoperative pain are often related to the patient’s new bite. Adjusting a patient’s bite after a new filing is often challenging because each of us have many different attack patterns when we chew. Patients may not always identify these patterns when asked by their dentist, which is critical in the adjustment process. An incorrect bite can lead to chewing discomfort along with hot and cold sensitivity. So the first thing your dentist should check is the bite. If that does not relieve your discomfort, it’s very possible you may have to just wait it out to see if the symptoms resolve. I often advise my patients to take an anti-inflammatory to help calm the nerve after any dental procedure for 48 hours following treatment. The reasons for discomfort associated with these procedures is identical to those as mentioned in having a white filling performed. However, when crowns and porcelain fillings are indicated there is usually much greater pre-existing damage to the existing tooth. These procedures are used when a normal filling can no longer be placed to restore the tooth. Therefore, greater trauma will occur from these procedures. Knowing our risks are higher we utilize many unique tricks such as applying special gels and conditions to the tooth after the tooth has been prepared during the temporization process. If the tooth is high risk of having a problem or if the patient returns with symptoms of pain we will also use special cements in an effort to help calm the nerve. Most often a patient will experience some degree of discomfort after these procedures. While you are waiting for your permanent crown or porcelain filling avoid chewing on that area to prevent dislodgement of the temporary. Without the temporary on the tooth is unprotected and will be extremely sensitive to air and liquids. Expect sensitivity if you drink something very cold or hot. I recommended drinking liquids at room temperature to avoid shocking the tooth. If your temporary does come off contact your dentist immediately for instructions. If you are unable to return to the office, clean out the inside of the temporary and try to position is back on the tooth to protect it. You may even purchase temporary cements at the drug story. 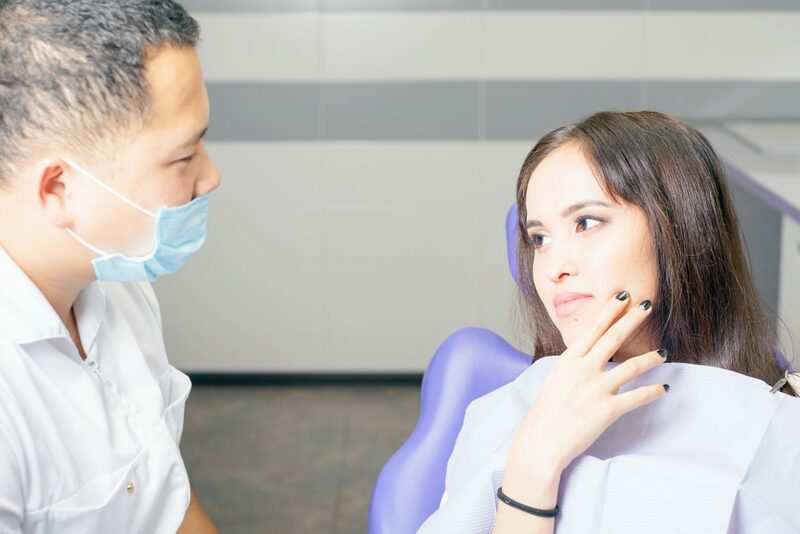 If you experience pain after having your permanent crown or porcelain filling placed, it’s most often related to the bite as discussed with new fillings. SO be sure to get back to the dentist immediately or problems will only get worse. Many times patients ignore their symptoms and when they finally return there is little the dentist can do to correct the problem without root canal treatment. If symptoms do not go away root canal treatment is the likely outcome. Again, an anti-inflammatory for the next 48 hours will be beneficial. I will be the first to admit the degree of discomfort is difficult to predict.